**PLEASE READ THE PROPERTY DESCRIPTION BELOW AND BE SURE TO READ OUR RATES DISCLAIMER AT THE BOTTOM OF THIS DESCRIPTION** OUR GUESTS VACATIONS ARE SO IMPORTANT TO US AND WE HOPE YOU STAY WITH US!!! TROPICAL group get-aways, year round with NO PLANES to board, NO MOSQUITOS and it NEVER RAINS in our indoor tropical Paradise. 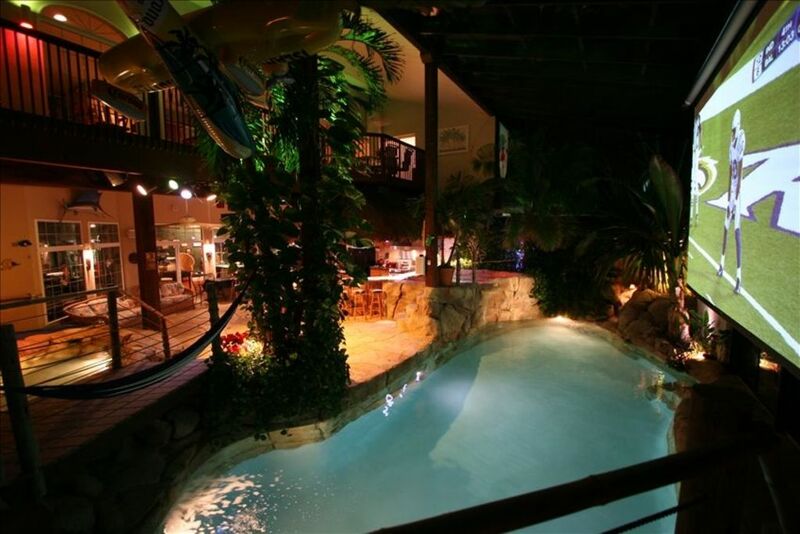 Indoor pool, hot-tub, swim-up tiki bar, koi pond, Five waterfalls to 12 foot tall, 30 foot live palm and bannana trees, 25 foot HD theater, 12 foot state of the art gaming theater, game room and gym. Because you HAVE TO SEE HAWAII IN THE Philly SUBURBS TO BELEIVE IT! FIVE FALLS ESTATE sleeps up to 18 people in 7 bedrooms - 4 kings - (includes two queen beds in the loft), two HDTV theaters - one drops down over the tropical room glass, the enormous, 25 FEET, high definition picture is complimented by 10,000 watts of rock concert sound equipment and is actual movie theater size. The second theater is in the nearby game room and is connected to X-Box, Wii and X-Box Kinect. The all glass tropical paradise room was designed to offer all the luxuries and features of a luxury resort and then some but the best part of all is that you have the whole resort to yourself! The room is temperature and humidity controlled to a tropic 80 degrees year round - YES even in the winter when it could be cold and snowing outside! Guest can relax in the ultimate luxury, swim, make frozen drinks and barbeque but they can also listen to Pandora through a 10,000 watt 9.3 channel club surround sound system, organize their own music video play list online to watch on the huge THEATER SCREEN. While in the pool, at the swim-up bar or in the hot-tub, guests can watch Utube and any internet content, cable TV, sporting events, movies and more! Prior to taking a swim vacationers can work-out in the gym, play XBox Kinect or Wii in the seperate gaming theater, play billiards, pinball, bubble hockey or foosball. In addition to the two theaters there are 7 HDTV flat screens in the house up to 70 inches, 42 speakers -including two showers with music - and three rooms with Digital DTS theater surround sound systems. There are places for adults and children to have fun together and have adult time all to yourself while the kids are nearby HAVING THE TIME OF THEIR LIFE! Skip now to the house website link at very bottom for most photos and information. WHO RENTS THIS ESTATE? Pro-sports players and movie stars love our Concierge Royalty Package but we also rent the base estate for two and three night weekends for family reunions where guests of all ages enjoy an exclusive tropical get-a-way without spending too much or commuting very far. Inquire about this pricing which varies based on club membership, time of year and services provided. We welcome you to relax, spread out and enjoy the luxury and expansive splendor of Five Falls Estate in total, discreet privacy. Our Royalty Package caters to celebrity lifestyles where one call does it all. Your private concierge makes sure that what you want is here when you arrive and we pride ourselves in fulfilling even the most peculiar requests - no questions - just done! This is not a hotel or banquet hall and the owner only rents a few times a year to select family groups. Occupancy is by invitation only based on current booking load and what vacation club members would like to use the estate for. Five Falls Estate is 1.5 hours from New York City and minutes away from Philadelphia. There are numorous five star restaurants and area attractions including winery tours, golf courses, Longwood Gardens, Tyler Arboretum, the Liberty Bell, Franklin Institute, Camden Aquarium, Philadelphia Zoo and a very long list of concert, live theater halls, museums and shopping meccas. Poolside hot rock massage/facials and other spa treatments available. Sit at the sun-drenched swim-up bar and enjoy a great-start breakfast or have it delivered to your private bedroom lanai. Master Suite - Includes vaulted ceiling, sitting room with coffee bar, wet bar, TV, DVD, private lanai and 150 square-foot master bath. Stereo sound in master bedroom, shower and on outside lanai porch. Workout Gym - Air-conditioned with view of Koi pond, waterfalls and grotto, free weights, Universal weight machine, treadmill, eliptical machine, heavy bag, speed bag and other equipment, DVD TV, VCR and stereo sound. Due to zoning restrictions, the tropical room at Five Falls Estate can no longer be rented independently for parties and corporate events. This is a truly unique and memorable location to host a family reunion but you must lease the whole house as a home rental. The true movie-theater size screen and commercial sound system make this a great room for family celebrations. The projector is also wired to a computer and is great for presentations. Our dance floor area is equipped with club lighting and special effects, including a strobe light and colored lights that dance to the beat of the music. For our most popular party, a catered luau, we fly in fresh flower leis from Hawaii, project Hawaiian scenery and volcano footage on the big, 25-foot screen, and roast a whole pig. Once inside our warm tropical environment, your friends and family will forget that it is the dead of winter outside and will talk about your unique party for years to come. PLEASE CLICK THE YouTube LINK BELOW for a virtual tour of the house. Ice Luge and Martini Ice Bar shown in video are optional. Please be sure to also view all our SLOPES TO SANDS DREAM VACATION CLUB HOMES including our New Jersey Seashore and Ski-in/ski-out Houses on ski slopes and our staffed carribean villa with 150' waterslide at slopestosands. com or click the link at the very bottom of this listing. ***RATES DISCLAIMER*** BEFORE YOU SUBMIT A RESERVATION REQUEST PLEASE REVIEW OUR LAST PHOTO IN OUR PHOTO ALBUM FOR ACTUAL RATES TO CONFIRM. PLEASE NOTE THAT OUR RATES ARE NOT 100% COMPATIBLE WITH HOMEAWAYS RATE ESTIMATING SYSTEM. IF YOU SUBMIT REQUEST TO BOOK IT DOES NOT MEAN THAT YOUR RESERVATION IS CONFIRMED. SOMETIMES THE RATES ARE LOWER THAT WHAT HOMEAWAY CALCULATES AND SOMETIMES THE RATES ARE HIGHER SOMETIMES DEPENDING ON THE STAY, WE ARE OFFERING DISCOUNTS SO PLEASE INQUIRE WITHIN FOR ACTUAL RATES. WE DO OUR BEST TO KEEP OUR RATES CLOSE TO ACCURATE BUT DO NOT MAINTAIN CALENDAR RATES MANY YEARS INTO THE FUTURE AND WE ALSO OFFER DISCOUNTS AND VARIABLE RATES BASED ON THE NUMBER OF NIGHTS TAKEN WHICH HOMEAWAY CAN NOT ACCOMODATE FOR IN THEIR QUOTING SYSTEM*** PLEASE LOOK AT THE LAST PHOTO IN OUR LISTING TO CONFIRM RATES AND IF YOU HAVE A QUESTION -- PLEASE INQUIRE WITHIN BEFORE SUBMITTING A RESERVATION REQUEST THAT IF INCORRECT, WILL BE MODIFIED TO REFLECT ACCURATE PRICING. The owner is an award winning designer/developer who has worked with theme park architects and engineers to create this ONE-OF-A-KIND paradise which is more than a luxury estate. It is an entertainment venue where parents and children can have fun and quality time together. THE LEGEND OF KUKLAMUNGA FALLS Years ago, when rivers and streams doubled as America’s highways, Ridley Creek was a popular trade route for Minquas and Susquehanna Indians. Minquas Path, behind the house later became known as The Great Trail and was used to transport thousands of beaver skins to the first Dutch trading posts on the Delaware River. One cool evening, Chief Choo stumbled away from a campsite along the trail and returned telling tales of a tropical rock canyon with warm waterfalls and hot water swimming holes. Most thought Choo was crazy or “kookoo”, but he soon was joined by a host of good friends who would bring food and spirits and sneak off to the falls. These people became known as the Kookachoos, and they called the falls “Kuklamunga”. These customs were passed on from generation to generation until the falls were tragically buried by the construction of U.S. Route 1. Giovanni Cacciutti learned about the Kukachoos and stumbled across a map of Kuklamunga Falls while researching the roots of similar-sounding names. In the year 2000, they excavated the canyon down to the rare geocentric fissure that is responsible for the tropical anomaly and designed a house around it. Welcome friends and guests to Kuklamunga Falls. Together we hope to carry on the legacy of the Kukachoos. Skip to the house website link at very bottom for most photos and information. Skip to the house website for most information or click the link at the very bottom of this listing. Skip to the house website link at very bottom for most photos and information. * Gas Fireplace * Foosball * Private Hot Tub * Full Kitchen * Catering Available * Deck/Patio * Gazebo * Minimum age limit for Renters - Please inquire * Workout Gym - Air-conditioned with view of Koi pond, waterfalls and grotto, free weights, Universal weight machine, treadmill, heavy bag, speed bag and other equipment, DVD TV, VCR and stereo sound. The property was absolutely amazing. Way more amazing than what the pictures displayed! We did a small weekend birthday celebration for my niece and it turned out to be such an amazing experience for everyone. It felt like we were at an all-inclusive island vacation without the travel hassle. Not only was the house amazing but the booking staff and property manager was so professional and readily available to answer all my questions and request. Overall the entire process and experience was great and my family and I are looking forward to booking this property again soon! It was a truly unique experience! It felt like being at a resort! Everything was incredible. That pool area is absolutely breath taking. The photos actually don’t do it justice, it’s better in person. We loved the swim up bar and the downstairs kitchen. In the main part of the house, the beds were so comfortable, a few of my friends checked the mattress to buy for themselves at home. Amazing experience, you will love it if you rent there. This house was absolutely amazing for our new years get away! We stayed for 5 days and 4 nights and everything was perfect! The pool and hot tub was a perfect touch for our “hawaii getaway” in the winter! We came with a group of twenty and this house was the perect size for us! Philly was just 30 mins away so we definitely got our philly cheese steaks! Everything about this house was amazing! The pictures dont do it justice! Would definitely rent this house again and would recommend the house to anyone thinking about renting the house! Scott, Nancy and Mike were very responsive with our questions all the way to the very last day of our stay! Thank you again for letting us stay in your amazing home! Every summer we do a family vacation, this summer we decided to stay in the states, this was the perfect getaway for us. It was more than we expected, it definitely felt tropical, who would have thought there would be a vacation home like this one close to home. The service was phenomenal, we received a tour guide who showed us everything that we needed to know about our 4 day stay. We can’t wait to go back! Our group stayed for two nights in February- it was the perfect tropical getaway for us, without having to travel too far from home. The home had everything we needed for a fun weekend away- pool, hot tub, A/V system and games. Plus, it was comfortable, clean and well appointed. Booking the property was a breeze, and Nancy, Mike and Bob all helped to ensure that our stay went smoothly. We would not hesitate to recommend it again to anyone looking for a fun weekend for a large group. Best weekend of our lives!!! Our family and closest friends celebrated our marriage weekend at Five Falls Estate. This location was a perfect place to relax and have fun while everyone had time to get to know each other better. The amazing amenities made it so easy to plan for a fun and relaxing weekend, because there were so many ways to keep everyone entertained, and there was plenty of space for friends and family to gather. The swim-up tiki bar, hot tub, and pools were a huge hit, as were the game room and dance floor. Our only regret was that we didn’t stay longer! SKIP TO HOUSE WEB-SITE LINK AT VERY BOTTOM OF LISTING FOR MOST INFORMATION. *Xfinity Live: New outdoor/indoor complex near these stadiums offering restaurants, bars and sports entertainment. *Fun Tip: The restaurants on State Street in Media offer Dining Under the Stars each Wednesday night in the summer. The borough closes the street and some restaurants offer the opportunity to enjoy your dinner under the stars. BE SURE TO CLICK THE HOUSE WEB-SITE LINK BELOW TO SEE AREA ATTRACTIONS. Our homes have a great deal of electronics, furniture, appliances and equipment such as hot tubs, computers, wireless routers, theaters, cable TV, bubble hockey, TVs, stereos, fireplaces, etc. These items receive about 20 times the typical use of products in a typical home. In many ways we are like an amusement park that may occasionally have an attraction that is out. We buy quality items, keep them maintained and buy service contracts on them but we do not guarantee them and unfortunately they are not immune to breakdowns and occasionally need repairs. We try to keep spares of some items, will call repairmen immediately, but will NOT provide refunds if an appliance, piece of furniture or amenity is not working due to circumstances beyond our control.